Late Photo A Day 23 'Something Old' - I could have taken a pic of the moldy blueberries in the fridge but 'Inside my Fridge' is the theme on the 29th - and I didn't want to gross you out. So here's something old and pretty. Hope it gets you in the mood for Australia Day picnics on January 26th. 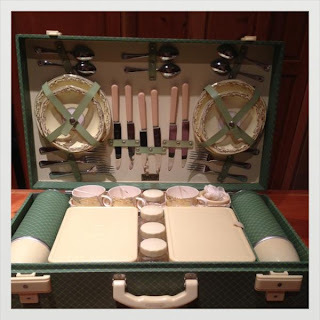 This is a circa-1950s Brexton picnic case with china and bakelite - never used. it's so romantic looking. I bought it about 17 years ago from the family of two sisters who used to operate a china shop in our town a long time ago. They were selling the sisters' possessions and this was supposedly an item in their old stock. Day 24 'Guilty Pleasure' - books and magazines. I am such a bookworm. 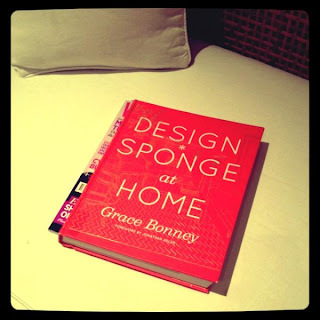 Check out Design Sponge for Home by Grace Bonney, founder of the Design Sponge blog. It's a beautiful book that gives you a peak into the homes of some amazingly creative people, and includes some clever projects.